Honda Motor Company Ltd. is known around the world for its cars, motorcycles, and power products. 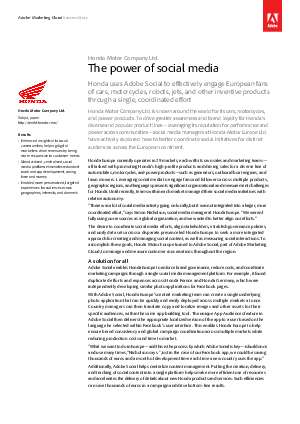 To drive greater awareness and brand loyalty for Honda’s diverse and popular product lines—leveraging its reputation for performance and power across communities—social media managers at Honda Motor Europe Ltd. have actively explored how to better coordinate social initiatives for distinct audiences across the European continent. Honda Europe currently operates in 29 markets, each with its own sales and marketing teams— all tasked with promoting Honda’s high-profile products and driving sales for a diverse line of automobiles, motorcycles, and power products—such as generators, outboard boat engines, and lawn mowers. Leveraging social media to engage fans and followers across multiple products, geographic regions, and languages presents significant organizational and measurement challenges for Honda. Until recently, teams within each market managed their social media initiatives with relative autonomy.